23 year old Cornishwoman Amy Roberts is resuscitating British Trad Jazz with a much-needed injection of energy and joie de vivre. A charismatic multi-instrumentalist with a unique style she is the youngest ever member of the legendary Big Chris Barber Band (BCBB) and the first female musician in what are collectively known as The Three Bs: The BCBB, Kenny Ball and His Jazzmen and Acker Bilk and His Paramount Jazz Band. Amy honed her skills on the Jazz Club circuit, travelling the length and breadth of the country and earning a reputation as one of the hardest working musicians in British Jazz. Since winning the Rising Star category at the 2009 British Jazz Awards Amy has become a household name, breaking the mould in the somewhat parochial world of Trad Jazz. In July she graduated from the Royal Northern College of Music with a First Class Honours Degree. A principal study saxophonist, Amy continued to break boundaries at the RNCM, performing the Artie Shaw Clarinet Concerto with the RNCM Big Band and giving a typically idiosyncratic performance in the final of the Gold Medal Competition, the highest award offered by the RNCM. I took the opportunity to talk to Amy as she took a short break from her tour of European festivals at her family home in Cornwall. What is it like to be on tour with the BCBB and the Three Bs, particularly as the youngest member and the first woman? I love life on the road. I’ve always been comfortable spending time with older people and I don’t like sitting around and doing nothing so I explore wherever we play. In April we did a UK tour and then drove to Germany averaging four hours travelling a day which is really tiring, but you get to see places you would never see as a tourist. It’s a social career. Everyone’s lovely and we’re a big happy family. On tour I’ve got several surrogate uncles, a couple of granddads and a great granddad. Chris Barber is nearly four times my age. He was in the car with us on the last tour and he was talking about people you think of as founding fathers of British music. It’s an education. He’s responsible for so much and it’s fascinating to hear him talk. He truly is a legend in his own lifetime. Traditional jazz was and is a male dominated world. Looking back to the 60s, women were supposed to be homemakers so there aren’t many female role models in jazz. It’s probably not possible to have a good family life while touring. You live out of a suitcase spending a lot of time in pubs and bars and that’s just not conducive to relationships and traditional female roles. Jazz isn’t a womanly pursuit and instruments such as the drums are perceived as manly from a young age. You often hear people say, “Play it like a man” (to put it politely) but I’ve tried to challenge that. How do you keep in practice on tour? It’s not easy - in fact it’s a nightmare. We drive for much of the day, arrive with an hour and a half to sound check, shower and eat and then play. We’re often not back before 2am and are up at 8am the next day to do it again. You know when you’ve just got back from a tour because you’ve picked up lots of bad habits. You spend three weeks trying to fix them and then you’re back on tour and picking up new ones. Even when I’m not on tour keeping all the instruments up to scratch is a real challenge. Flute was always my first instrument and the one I loved most. Clarinet was second, then I picked up the saxophone some time later and yet that is the one I gig most. I go through phases of not playing one for a while and then picking it up and playing it relentlessly for a day. I find it hard to practise my doubles every day because in reality you just don’t have time. I’ve had to work very hard to keep them all going but it’s always a surprise when I pick them up and they still work. If you have an understanding of the technique of all three you can practise one and it helps something in the others. Even so, if you don’t practise you don’t get better. What is it like to play with your heroes on an equal footing? At the Keswick Jazz Festival this year I played with saxophonist Alan Barnes and trumpeter Bruce Adams, two musicians for whom I have a great deal of respect. I’m still amazed that they even shared a stage with me. It’s the most surreal thing to be standing next to them and treated as an equal because I feel I’ll never be half as good as them. Every top musician I have met has been incredibly supportive and encouraging. For me, making a real effort to be pleasant and respectful is important because if you’re going on tour with someone or sharing the stage at gigs then I want the whole experience to be easygoing, friendly and fun. 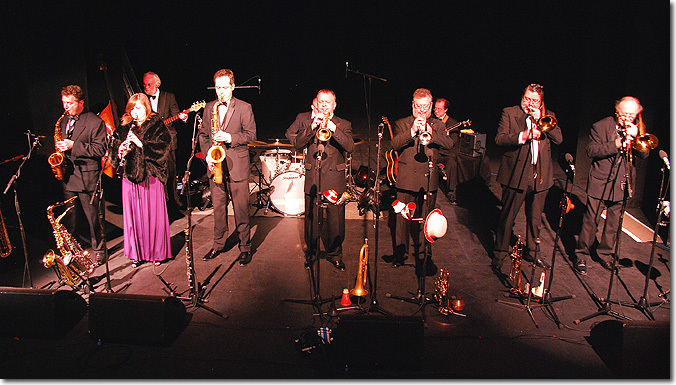 Trad Jazz is synonymous with an ageing, conservative audience. how do you see the music developing and attracting new audiences? A couple of weeks ago I did a gig with some young musicians in London. I was so surprised that other people in their twenties were playing more traditional types of jazz and that there is actually a big scene taking off. There are a lot of people playing under the radar who aren’t on the trad circuit and a lot of young people who want to dress up in old costumes and dance to them. I really think there is going to be a trad boom the like of which we haven’t seen since the 50s and 60s. Festivals like the Upton Jazz Festival are featuring the Best of Young Jazz. Young professionals are involved in inspirational role model sessions with children, and it’s giving a message to young people that this is what they could be doing in a few years time. A part of the problem is that people of all ages and backgrounds are not always open minded; they like what they like and might be apprehensive to listen to anything different. We need to get not only the children but also the parents of these students in to festivals and open their ears and minds to things they wouldn’t normally hear. Do you see yourself developing the genre? The music I’m playing is full of energy. I’m about lively energetic jazz that makes people smile. The organiser of a modern jazz festival came to see my band playing at the Upton Jazz Festival. He was looking for a trad group to play at his festival. He said: “This isn’t trad. I don’t know what it is but I like it”. The music I really enjoy isn’t necessarily what a typical trad audience might expect but it seems to be embraced by both them and audiences from a wide range of musical interests. I probably started off as a trad player, but I don’t know how to define what I play now. It’s accessible because it’s full of melodies, energy and personality and that carries over to audiences. How did you become a protagonist of the seldom-scene and rarely-heard C melody saxophone? I saw one advertised in the local paper and I thought “that looks interesting”, had a look and it was very tarnished but in beautiful condition. The guy didn’t know what he had and I also knew nothing about them. I bought it and cleaned it up and put it under the bed until I had the time to do something with it. Two years later I went into a lesson with Rob Buckland at RNCM and he said he had a piece called Deep Purple for alto that would suit me. Rob told me to do some research and I went home and listened to the piece and thought, “Great, it’s cheesy and outrageous, that’s me”. The piece was by an American virtuoso called Rudy Wiedoeft who played the C melody saxophone. I was inspired and from that moment on I was annoying everyone in saxophone class with Wiedoeft’s novelty music for the C melody. The great thing about the C melody is that it sounds like the twenties. It takes you straight back. It’s a horrible instrument to play because it’s so out of tune and acoustically it’s a nightmare, but that adds to the fun. No one in the UK plays the Rudy Wiedoeft repertoire on C melody possibly because they went out of production in 1927. I can’t think why! Where has Wiedoeft’s novelty repertoire taken you? Well for one thing I’ve ended up performing dressed as a chicken for a work called Rubenola in which the C melody mimics chickens clucking. The RNCM is quite a serious institution and I thought that if I’m going to play novelty music I had better go the whole way or people might think I’d gone completely mad. I went to Primark with a friend and made a chicken costume from scratch and walked into saxophone class playing Rubenola with chicken feet and a beak and plumage. If it’s going to be done it has to be completely over the top, which is the story of my time at college. There’s even a video on YouTube of the performance. The dressing up didn’t end there. In my third year recital I played John’s Journal by Jonathan Lloyd. It tells the story of a week in the life of a saxophonist, dedicated to John Harle. The first movement is about being hungover and the second is about being late for work. I managed to cover the floor around the piano with empty beer bottles, borrowed a dressing screen from the opera department and dressed my accompanist in dressing gown, slippers and pyjama bottoms with a newspaper and I wore the same. We meandered on stage stretching and yawning before playing the first movement which is a real dirge, with false endings which are greatfun. Then the pianist set off an alarm clock and we went through the motions of surprise and dashed behind the dressing screen, throwing slippers, pyjamas, two bras and fluffy handcuffs over the top. Then we came out and did the rest of the recital dead straight. No one was expecting that. How do you reconcile playing often-austere contemporary classical music with jazz and novelty music? To be honest I think that novelty music was my way of escaping the seriousness of conservatoire education. I take music very seriously and at the top of my list is a desire to do composer and music justice. I chose to integrate learning serious classical repertoire with novelty music but both had to be played to the best of my ability. Due to its diatonic and melodic nature people assume that playing novelty music is easy when in fact it is the complete opposite. If you go in thinking that it is going to be funny by default then it won’t be. In my view there is good music and bad music. The important thing is how the music is played. Recently three days included guesting with Clare Teal, playing Somewhere over the Rainbow in front of a wind band (at Plas Newydd in Anglesey), and playing a Trad gig. It’s a case of having a deep understanding of all the different styles and being able to adapt to what’s around you. Some people have said to me, “You can’t do that,” and I’ve said why? “Because it’s not done.” This has driven me to keep pushing the boundaries and to continue thinking outside the box. The RNCM does not offer a course in jazz; how have you found studying on a classical course and what has it contributed to your playing? My experience has probably been very different to my peers. For me being at college has combined learning saxophone technique and developing that intense understanding of the instrument in a way that is only possible on a classical course alongside working as a jazz musician in the wider world. This can only open doors for your interpretation of jazz and other forms of music. As a jazz musician on a classical course I didn’t get the jazz tuition that jazz musicians studying on a specialist jazz course experience. I may have ended up with different methods and a lot less understanding of modern jazz but my own style is more natural for me. College is like a tool; whether it is useful depends on how you use it. You have to be prepared to be different even if it is not the done thing. It’s very easy to get absorbed into the college bubble of specialising in esoteric music. Orchestras seldom employ saxophones so it was important to be able to play jazz and do a bit of doubling on other instruments because it’s so hard to survive as a musician. My tutor Rob Buckland is amazing and an absolute star. I couldn’t have asked for more than what he gave me. If you use it in a constructive way and work hard I think you can’t go wrong. What’s the music scene like in Europe and America compared to the UK? I went to New Orleans for the first time early in 2007 after the hurricane. The local musicians have an amazing natural feel that reminds you that it’s not all about technique; it’s about being able to open up your soul and say what you have got to say. It’s in their culture. In Europe it seems that live music is more valued than in the UK. There’s a lot of funding for lessons and the public are exposed to wider ranges of music via media such as TV shows, and we’re not talking about The X Factor. The most exciting place I’ve played was the Jazz festival Enkhuizen in Holland. It’s like a rock festival with young people jumping up and down to trad music. Young bands will attract young audiences and if there are young people watching it is only going to get better. That is what is going to build up the scene again. It will be fascinating to see what happens in the next ten years. What was it like to be awarded the Rising Star Category in the British Jazz Awards in 2009? I won first place in 2009 and second in 2010 so I’m getting worse! It was crazy because in 2009 I didn’t know I was nominated. It made it more special because it was a massive surprise. It’s the strangest thing to have people believe in you, especially when you don’t know them. The other nominees were people I consider as absolutely awesome so to be in the same category as them was incredible. It’s nice for people to say that they like what you do and that you’ve got potential. I’ve got to live up to it now. Amy is currently touring with the BcBB and the three Bs, but can probably be found at your nearest major jazz festival. Her outstanding performing skills are guaranteed to amaze even the sternest critics, although the chicken costume is taking a rest.